On the same day as the UK Election (May 7), I was honored to be invited to present at the Online Influence conference in Cardiff. I presented a keynote in the morning on "from Social Media to Social Business" which was well received from the tweets and feedback at the event. You can watch a video replay of the talk here. I was also invited to take part on a panel as the last item of the day, in front of 300 or so people. The panel consisted of William Conner, from PWC, Jeremy Waite from Salesforce (a good friend of mine), Michael Page, from Synthesio, Luke Moore, from Crimson Hexagon, and Mike Bevans from Yahoo. When I took my seat on stage, I very quickly realized that the panel consisted of five middle-aged men (six including William as Chair), clearly not a fair representation of the digital, social or even real world. What I had learned just before the panel started was the fact that there were two female panellists that had been invited (thus balancing the mix with 40:60 female), however both were unable to attend, one apparently involved in voting on the General election being held in the UK on the same day. I am not sure if William knew about the two female panelists dropping out, so no mention of it was made, making the five of us look quite stupid on stage at that very moment. We were asked to respond to the issue of gender diversity, and I mentioned that I fully support women on boards, and there is also an active campaign by the UK Government, headed by Lord Davies to ensure 25 percent female representation on boards by the end of 2015, and in Australia this goal is 30 percent by 2017. I did mention that there was a real opportunity for people of either gender to prove their Digital literacy (thus helping to inject strong digital skills on FTSE100 boards), and this is a topic for an upcoming blog post. You can watch a replay of my presentation at the Northern Ireland Chamber of Commerce in Belfast earlier this month where I outlined the urgent need for digital literacy on boards in the UK and beyond. However, as I was talking about digital diversity I realized I was not addressing the very real issue of gender diversity on the very panel that I was sitting on. I asked the young lady her name. "Miranda," she said. What happened next changed the whole dynamic of the panel, and the discussion, and it lit up Twitter. 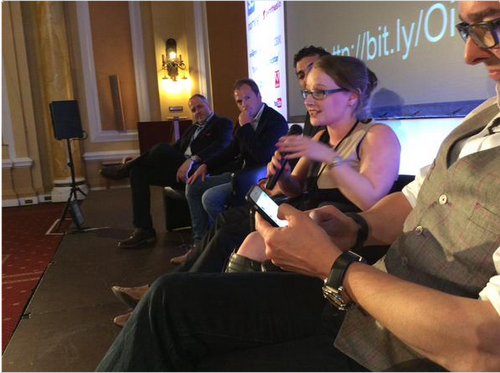 Thanks so much @AndrewGrill for giving up his seat for me at #Oi15. Amazing feedback! After the event, I heard that the organizers literally were looking through their hands wondering what this crazy Australian had done, and fearful of what might happen next. As it was, Miranda brought an amazing perspective to the panel as a 26-year-old small business owner. She explained that when she left school she found it hard to get a job so she started her own social media training agency, "Talking Social Media". The response to our new panelist was extremely positive, as I had expected. Now I am sure I am not the first male panelist to give up my seat and try to inject some gender diversity into a conference panel, but we still have a long way to go. There is an excellent Tumblr called "congrats you have an all male panel" that calls out the many, many conferences that neglect a female voice and perspective. Miranda rightly asked the question that many were asking at the conference, and she also had the confidence to come forward when I asked her to join the panel -- and I am so glad she did. So next time you are at a conference where there is an all-male panel, be the one who says "this is not right" and do something about it -- in real time. Read more insights at LondonCalling.co, or follow me @AndrewGrill.